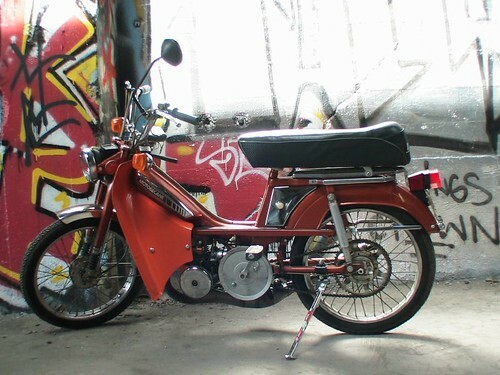 Portland Metblogs » Moped, Moped? As gas prices are rising local Portlanders are looking for alternate means of commuting around town. Bicycles are a number one as far as this city goes (we all know that!). But have you noticed more mopeds on the road? We’re talking small motorized engines with pedals here–not scooters! I certainly have. According to founder and co-owner Patrick Fitzgibbons, local scooter shop P-Town Scooters has been selling new Tomos mopeds by the half dozen load every week. Portland Craigslist has been popping up quite a few vintage ones as well. In my personal opinion, it’s a great thing that more people are hopping out of their cars and riding mopeds. They are efficient little machines that get about 100 miles per gallon. The vintage mopeds can be a bit of a pain with how much you have to repair the aging parts and mechanisms but so worth it once you get it running. Now–for full disclosure–I am a part of the local moped gang Puddle Cutters, a part of the national Moped Army. Much like the local bicycle culture, we have our own scene. What is amazing beyond the transportation issue is that Portland produces such unique subcultures such as this one. The Puddle cutters are having our annual rally this weekend, Hold My Beer, This is Going to be Awesome. We are raffling off a brand new Tomos moped with the generosity of P-Town Scooters. Raffle is this Sunday at Plan B, 5PM. Don’t miss out on the other events, rides, and parties either! Congrats on your first post! Nice subject too, it’s funny because I actually mentioned the Puddle Cutters at the Metblogs meet last Wednesday since we met at Plan B. If we had stayed longer we probably would’ve run into you guys. My husband is looking at getting a scooter – and we love Plan B – we totally need to come over and get in on that raffle!! You should come out! Buy raffle tickets at P-Town Scooters, at the raffle, or online! But you have to be there to win it. Looking forward to meeting any of you that show up! I was going to say almost exactly what acetracer said! Hello and welcome from one new poster to another. I can attest to sitting around at Plan B last week and talking about mopeds at the meetup. With the ludicrous gas prices, we’re all looking for alternatives… I generally have been sticking to the bike these days… but eeee-gads! What with the weather, I feel like that’s a bit too much sun exposure.